Communities are increasingly forced to deal with the long-term impacts of industrialization, where the veneer of economic prosperity ultimately gives away to reveal damaged communities and impaired ecological processes. We visited two sites that are deploying strategies to deal with such post-industrial conditions. One location was Palmerton, Pennsylvania; a Superfund town nestled in the bucolic backdrop of the Kitatinny Mountains. The other was Philadelphia’s Mill Creek, which is currently encapsulated within enormous sewer pipes underneath the city. The sustainable practices at Palmerton and Mill Creek provide some insight on how to design strategies that restore the ecological functions of highly impaired environments. 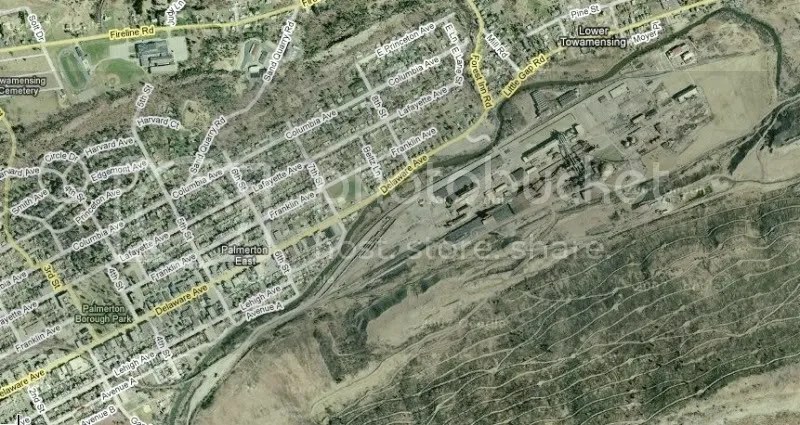 In 1898, Palmerton was founded as a factory town, nestled between two ridgelines, to conduct zinc smeltering during the height of industrialization in the United States. After decades of constant smeltering, the forest ecosystem collapsed, affecting an expanse of nearly 2,000 acres. Due to deposition of zinc, lead and cadmium from the furnaces, microorganisms in the soil substrate were killed off, and an integral component of the forest lifecycle ended. Without decomposers, nutrients in the soil were eliminated, leading a domino effect that decimated the forest. To date, it is the largest Superfund site east of the Mississippi River. On site, I was struck by the eerie landscape of windswept, bleached trees amongst barren grounds of dry dirt. Abandoned, rusted factory facitilies stood like sentinels to remind residents and visitors of a foregone era. Amazingly, some plant and wildlife species are returning to the environment; numerous sprouts of sassafras and sourgum were seen emerging from gnarled trunks. Due to the immensity of the contaminated area, removing the toxic substrate was out of the question. We learned about two strategies to rebuild the soil nutrients, with the goal of creating a capping layer of substrate above the contaminated soils. The first attempt to “green” the decimated slopes entailed terracing the mountain to establish over 60 miles of roadways. These costly roads provided access for trucks to spray “ecoloam” along the slopes. Ecoloam was an engineered growing medium composed of sludge and schlag material from city waste. From afar, this method successfully “greened” the mountainside. However, some critics of this method blame the pervasive amount of invasive species on the applied slopes, due to the unpredictability of the seed composition of the ecoloam mixture. Additionally, trees could not establish beyond the depth of the ecoloam because the roots would hit the contaminated substrate beneath. The land now belongs to telecommunications monolith known as Viacom, as a side acquisition through various transactions. To its credit, Viacom is funding the implementation of the second strategy, which relies on the hardiness of warm season native grass species to restore and stabilize the mountain slopes. Based on a serpentine barren-type ecology, this strategy aims to mimic the type of succession that had occurred in the site’s geological glaciation context. To establish the grasses, a growing medium composed of limestone, commercial fertilizer, grass seeds and compost was sprayed from the air, or hand-dropped along the slopes. This method appears to be less disruptive of the mountain slope because roads are not necessary, and the warm season grasses seem to be growing quite successfully. In addition to the warm-season grasses, the predominant plant species we observed included the gray birch, sassafras, poplar, aspen and chestnut oak trees. Furthermore, some rare plant species were thriving quite well in these extreme conditions, such as wild bleeding heart and sandwort. Despite the calculated efforts to establish native plants, invasive species continue to pose a threat to the restoration efforts. As such, the staff work hard to eradicate the butterfly bush and ailanthus tree that they find along the slopes. In trying to get settled in to Philadelphia, one of the first practical things I did was to sign up for internet service. (How else will I continue to blog? 😉 Philly provided a unique opportunity because of it’s city-wide wireless initiative. For those new to the concept of city-Read up excellent coverage of this on Breitbart’s blog). As a media justice activist and community advocate, Josh’s writings helped me better understand the politics of access to the internet and corporatization of wireless networks. From what I understand, the story of Wireless Philadelphia has had its compromises, but I thought this would be a good chance to put my dollar into relatively responsible corporate and support something that could increase affordable access to the community at large. And certainly there was an appeal to spending $20/month versus Comcast’s $43/month to get on the web. I set up an account with Earthlink and within a week received the equipment needed to access their city-wide wireless network, identified as: FeatherByEarthlink, earthlinkwifi, or WirelessPhiladelphia. (I’m not really sure what the differences were, but they all led me to the same sign-on page). The wireless router they sent in looked like any router, aside from a foot-long “mega-antenna” you need to attach in order to amplify the wireless signal. Unfortunately, my pursuit turns downhill from here. I found Earthlink’s wireless network to be extremely spotty and too slow to load the flash-filled, image-heavy many websites offer these days. Hell, I couldn’t even get to my bank’s website without getting a message saying that the router timed out because it couldn’t find a signal. Perhaps it was my location (I live in West Philly), perhaps the tall trees that line my street were obstructions, perhaps it was something in the atmosphere..I don’t really know. Sadly, I had to switch over to the competition (read, Comcast). I’m no techie, so I don’t know the challenges and intricacies of how to provide a fast, widespread wireless network, while staying affordable. I hope that Earthlink will figure this out and still stay in business.